Artificial light can create beautiful results in macro and close-up photography, but it can also cause your images to look forced, cheap, or unreal. Learning to position your lights — the key light determines how shadows are cast in a scene, and the fill light determines how dark those shadows are — will give you the best results. When working in the studio (that is, any space that gives you control over your lighting and backgrounds), the lights you use and the positions you set them in determine exactly how your subjects are represented in your photographs. Position a light source farther to the side of the camera, and more of your scene is covered in shadow. By bringing the light source closer to the camera, you can decrease how much of your scene is covered in shadow. The height of your light source determines how long the shadows will be in your scene. For example, the sun is low to the horizon at sunset, and so creates very long shadows. At high noon, the sun is high in the sky and produces shadows that barely stretch at all. Scenes that include more shadow coverage tend to have dramatic and mysterious qualities and reveal texture. Scenes that have little shadow coverage have more ambient qualities and minimize the appearance of texture. By choosing one of these styles or positioning your key light somewhere between these two extremes, you can find the light that best suits your scene and message. 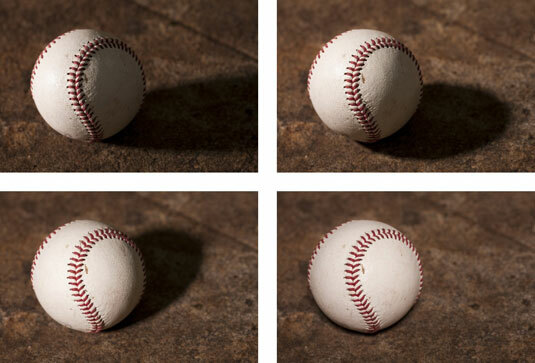 These photographs show four examples of how the key light affects shadows in a scene. The top two images represent the subject in a much more dramatic way because the shadows have a greater presence (caused by positioning the key light far to the side of the camera). This type of key light helps to emphasize the texture of the baseball. The top left image uses a low sidelight to create a long shadow, and the top right uses a high sidelight to create a shorter shadow. As the key light is positioned closer to the camera, and more in front of the subject, the drama is greatly reduced, and more information in the scene can be seen clearly. In the bottom left image, the key light was positioned between the far side of the scene and the camera’s position; this is known as a 3/4 lighting position. A 3/4 lighting setup provides an idea of the subject’s texture, but it emphasizes the ball’s form. The bottom right image provides an example of a front-lit situation. The shadow area is minimized. Neither texture nor form is emphasized; instead, the subject’s shape takes center stage.